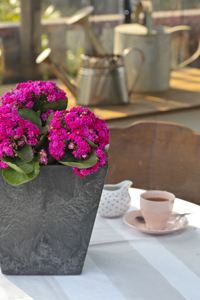 Kalanchoe blossfeldiana is one of the prettiest, most popular representatives of the succulent family. Although this particular kalanchoe has its origins in Madagascar, the unusual genus name is Chinese and has many different pronunciations. K. blossfeldiana is the most common kalanchoe, but there are many species that have similar growing requirements. The original K. blossfeldiana plant was tall and lanky, with blooms in orange and red. Over the years, though, the plant has been developed into a compact, floriferous specimen available in a wide variety of colours including yellow, orange, pinks, purples and whites. Kalanchoe blossfeldiana, and other kalanchoes, are growing in popularity as they offer cheery, bright indoor plants that are easy to grow and are available all year round. 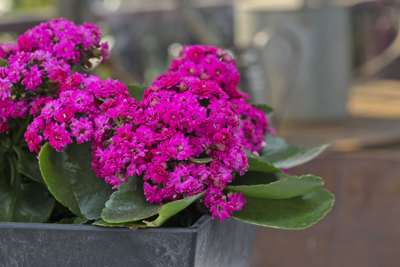 The blooms are long lasting and the foliage is unusually attractive, making potted kalanchoes a popular gift. – Kalanchoes love light. Position them close to windows with bright, indirect light. – Do not overwater. Ensure pots have drainage holes and allow the soil to dry between waterings. Water 2-3 times a week, as temperatures dictate. – To prolong and promote blooming, foliar feed every two weeks. – Deadhead spent flowers regularly. – Kalanchoes can also be grown in shady areas outdoors and on patios. Interesting fact: A mutant kalanchoe was discovered by a Swedish grower in 1998, with 32 petals instead of four. This plant was intensively bred and is now sold as Calandiva.